Plasloc, which specialises in supplying unique and stylish hoarding solutions for major infrastructure and construction projects, was asked by innovative interior fit-out contractor Fileturn Limited to help with a project at the luxury Andaz London. 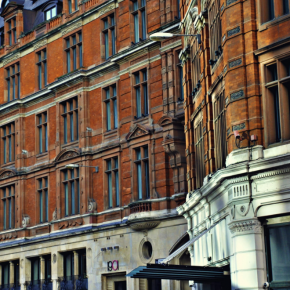 The Hyatt hotel, on Liverpool Street in the heart of East London, is housed in a beautiful redbrick Victorian building, designed by the architects of the Houses of Parliament. Fileturn was supplying its construction services to the hotel and needed Plasloc to help provide safe access for clients staying there during the work. 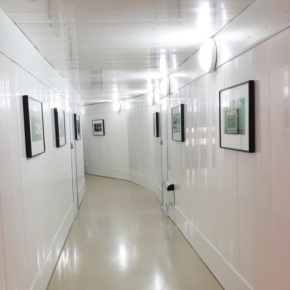 The solution was a temporary access tunnel that provides a safe route through the construction site, which would guarantee minimal disruption to clients and the operation of the hotel. Plasloc have designed and installed several scaffold-based internal temporary access tunnels to offices and receptions that have remained operational while demolition works take place. Their service also includes the demount and collection of the tunnels too. Leigh Matthews, Director of Plasloc, commented: “The client brief was to provide a safe access tunnel for hotel clients to pass through whilst demolition works to reception were being conducted. “The internal tunnel face also had to have a hygienic clean finish, while the external, construction, tunnel face had to hold a one-hour fire resistance. The installation went smoothly and the feedback from the client was excellent. This is the latest installation of many that the Newton Abbot-based company has done in the hospitality and leisure industry, due to the fact it is able to meet the high specifications this particular sector demands. Established in 2011, Plasloc has been an essential component in over 5700 projects and is a recognised brand amongst the UK’s leading retailers and building contractors. Last year’s projects included The Lioness, a members-only gastropub at Wembley Stadium, and the White City Living project, a huge regeneration development in central London. Designed for quick installation and easy removal, Plasloc’s environmentally friendly hoardings are clean and light and can be customised with corporate colours or printed graphics.